Many parents use steam sterilisers to sterilise baby products while some prefer the traditional method of boiling bottles in hot water. 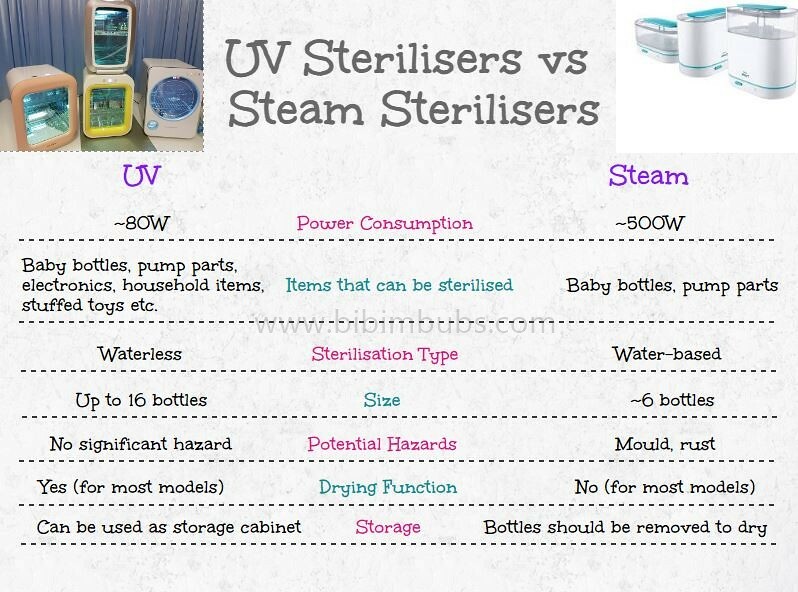 I chose a UV steriliser over a steam steriliser because I didn’t want the hassle of having to take out the bottles to dry after sterilising, or having to descale the steriliser every now and then. Also, steam sterilisers consume a staggering amount of power at 650W! Without a domestic helper, every bit of time saved counts. A UV steriliser seemed like the most convenient choice – just rinse, flick away excess water, press the button and leave till next use. There was zero risk of getting scalded by steam or boiling water. None of my bottles (MAM, Hegen PPSU) or pump equipment warped or changed colour either. Mine was a Haenim 2015 model which I bugged my husband to hand-carry back from Korea. It was a basic set with digital timer display, 2 Auto modes, 1 UV mode and 3 Fan modes. Since then, more brands have been brought in by local distributors. What advantages do they have over my old set? Instead of comparing the brands through website reviews and photos, I decided to do a thorough, first-hand review of the Korean brands currently available in the market. Filters must be brushed/washed regularly. For maximum efficiency, replace consumables annually (also depends on usage frequency). It’s time to replace the lamps when they start to dim at both ends. 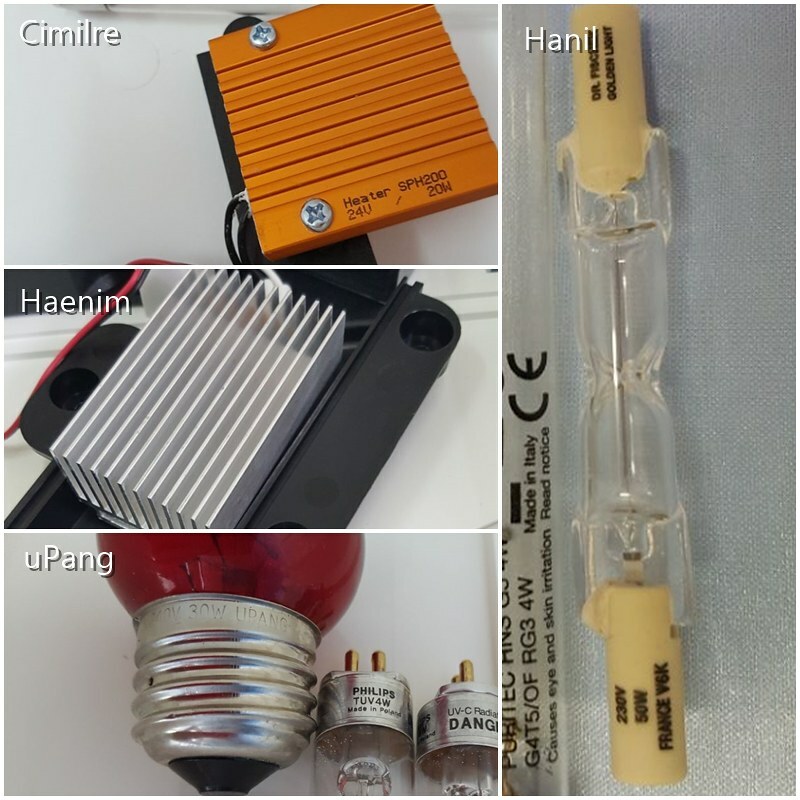 For Cimilre and Haenim, only the UV lamps need replacing as they use PTC heaters with a longer lifespan. Cimilre * Facebook page closed, sterilisers unavailable on website. No information about baby fairs or promotions. MISINFORMATION: There was no link to replacement UV lamps on Posh Baby Shop. Link in About page leads to its distributor’s website with no information on authorised re-sellers. No list of authorised re-sellers listed on Facebook. Updates are sporadic but up-to-date. Purchase link is listed in the About page. Pinned post shows the list of brands that the authorised distributor carries. uPang delivered the steriliser twice – neither my neighbour nor I was at home at the first delivery attempt, so they rescheduled another date. Vague delivery timeslot: 10am to 5pm was too long for us to “confirm that we will definitely be at home at that time”. Received steriliser the 2nd time with a free cutlery holder. Manufacturing dates do not affect warranty start dates but they give us an idea of how well the product sells. Haenim and Hanil sent newly manufactured stock whereas the other two brands sent sets which were manufactured a few months earlier. A minor issue was that Hanil and uPang created uncomfortable screeching noises when the bottom trays were pulled out. This did not happen with Cimilre and Haenim. All bottles were NUK wide-neck bottles and only the main compartments were used. Though neither stainless steel nor plastic hinges will rust, metal hinges are less likely to break than plastic hinges. Doors which can open fully are less restrictive. All sterilisers beep between cycles and revert to standby mode after completion. Wires neatly braided around main cable holder, no loose dangling wires. Sterilisers have a sterilising element (UV lamps) and a drying element (heaters/infrared bulbs). Infrared bulbs are commonly used in heaters and require timers to prevent overheating. Lamps have to be replaced annually. 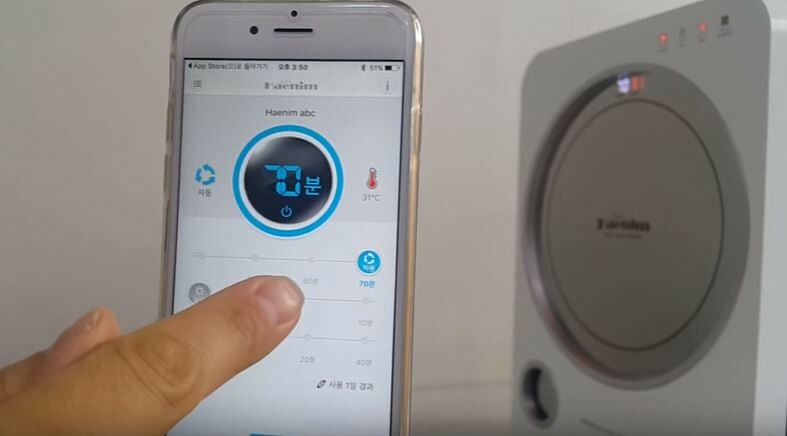 PTC (ceramic) heaters are incapable of overheating due to an inbuilt thermostat (safer for certain baby products which have temperature limits). Due to a longer lifespan, PTC heaters do not need to be replaced as often. 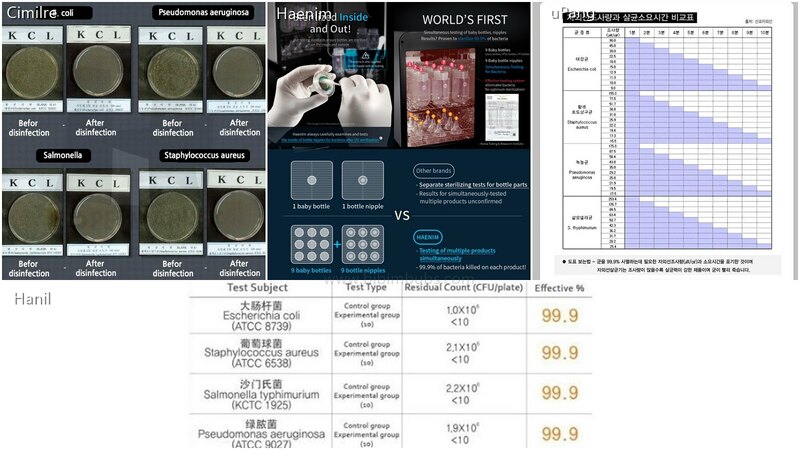 All brands report 99.9% sterilising efficacy with their lab tests and I should think so because the sterilising part depends on the UV lamps from OSRAM or Philips. The lab standard is to test on one baby bottle and 1 teat but only Haenim conducts its tests using 9 bottles and 9 teats. i.e. 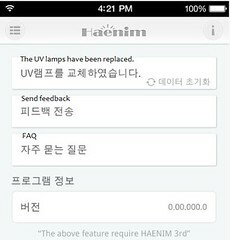 Haenim‘s Auto mode 1 runs for 30 minutes (40 minutes for the other brands) with shortest drying cycle of 20 minutes. Cimilre has the longest drying cycle of 35 minutes. 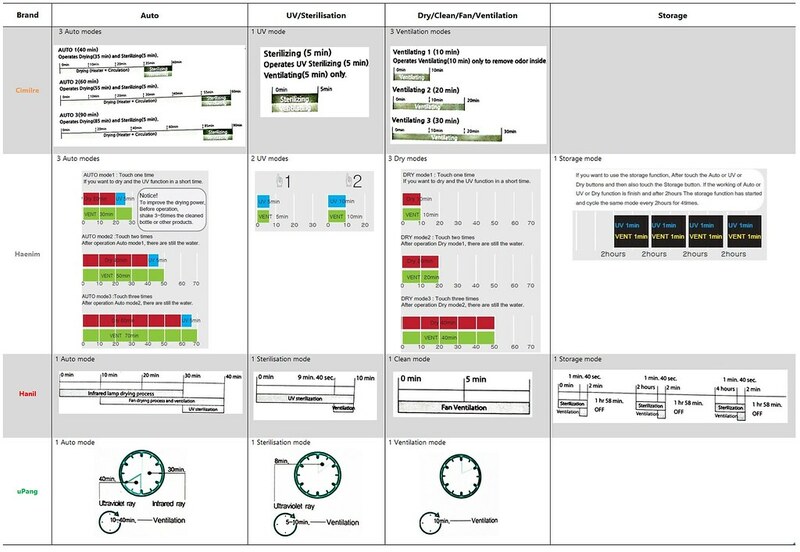 Despite the differences in cycle times, Auto mode 1 was tested because it is the most commonly used mode. Haenim was 2nd place, but its drying time was the shortest at 20 minutes. Cimilre‘s result was not ideal as it had the longest drying time of 35 minutes. Excess water should be flicked away from bottles before sterilising, therefore all sterilisers should dry bottles effectively in typical circumstances. A) Hanil: Are 3M HEPA filters safe to use? In July 2016, 3M Korea was found to have produced and supplied HEPA air filters containing Octylisothiazolinone (OIT), a toxic chemical linked to respiratory diseases. This did not only affect Hanil UV sterilisers which use them but other major brands using 3M filters for their air-conditioners (cars, residential, offices) and air purifiers. 3M Korea claimed lab tests showed that only a minute amount of substances were released into the air and there were no harmful effects to the human body and that in order for OIT to cause harm, a baby weighing 5kg would have to consume 250ml of OIT, or about 65 bottles daily. Hanil Korea then implemented a voluntary recall and refund of their sterilisers. 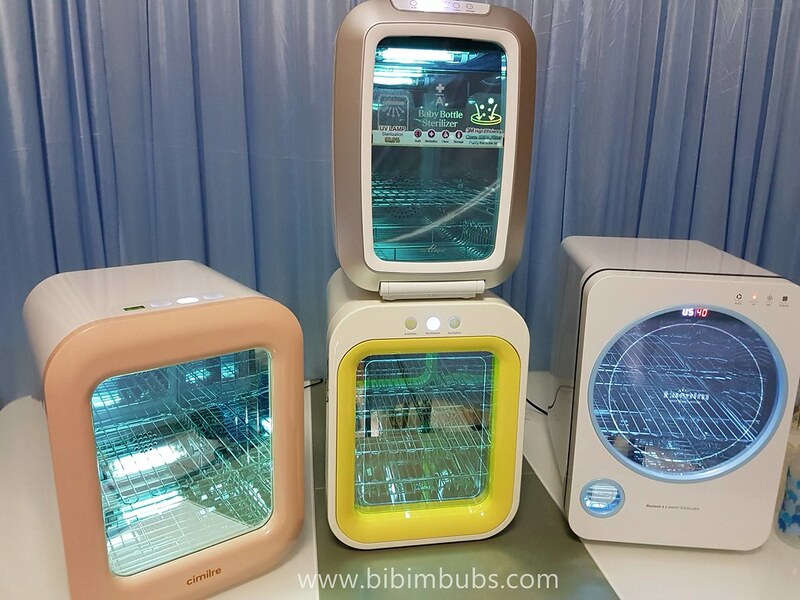 HOWEVER, it was reported in March 2017 on a Korean consumer news website that a man purchased Hanil UV steriliser from a Korea departmental store in July 2016 (part of the affected batch when the issue first occurred) and used it for his child until March when the baby developed a skin condition. He appealed for damages as he believed it was due to 3M’s HEPA filter. After the recall, 3M Korea stopped production of the affected products while maintaining its stance that the OIT levels were not harmful to the human body. 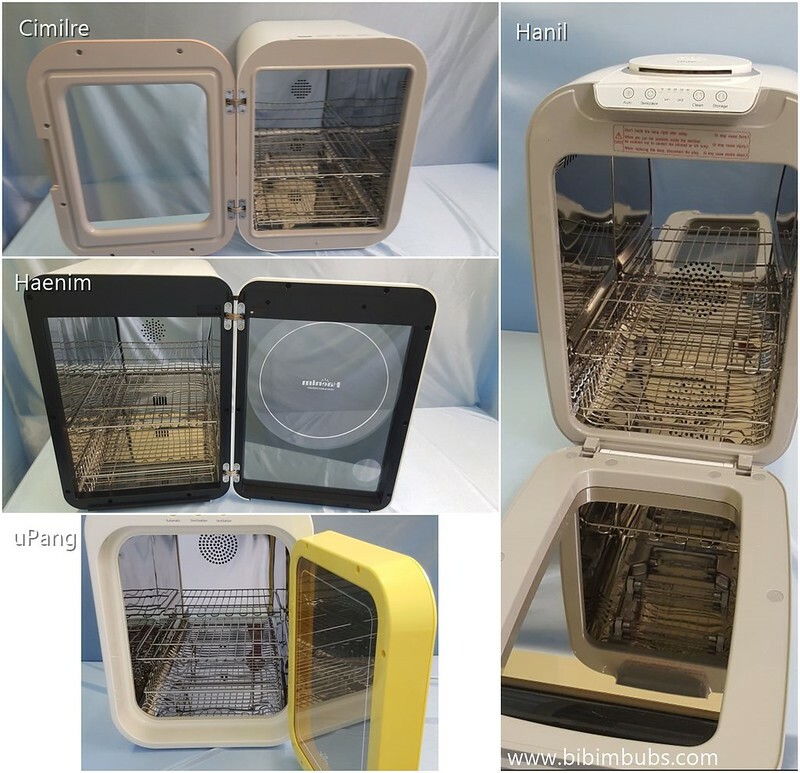 The affected Hanil UV steriliser models (which included HBS900SG – Singapore model) were listed on Hanil Korea’s website as well as other news articles. Subsequently, HBS900SG was subsequently REMOVED from Hanil Korea’s page and Hanil Singapore denied that the Singapore model was affected. They did, however, offer a replacement of HEPA filters to their customers. 3M Korea was also fined in January 2017 for overly exaggerating the antibacterial properties of their 3M HEPA filters which were used in car air-conditioning systems, the most among the 3 other firms who were fined. The advertisements claimed to reduce fine dust by 99% and 3M Korea was fined 1,700,000won (S$ 20,670) by Korea’s Fair Trade Commission. SO is it safe to use now!? The set I received from Hanil Singapore contained a 3M HEPA filter. Using the above screenshot I found on Facebook, I told them that I wanted some reassurance that the sterilisers were safe to use. The screenshot was of a lab test report dated January 2013, more than 4 years ago! 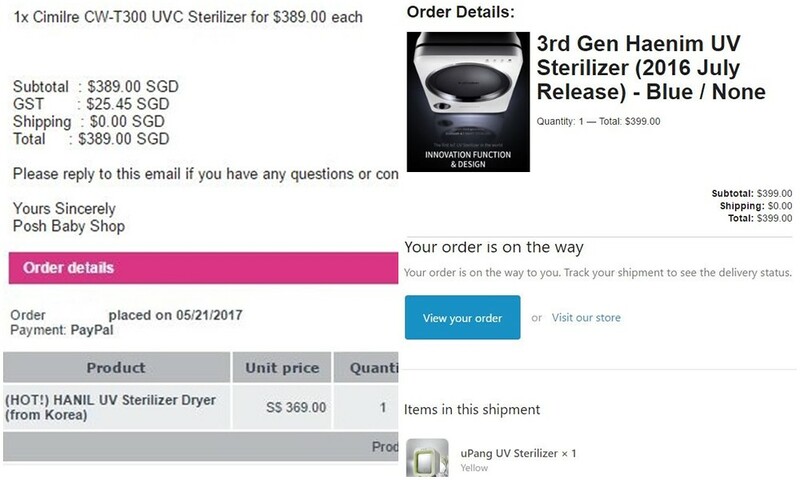 The steriliser I received was manufactured in March 2017 so while the steriliser does NOT come from the affected batch, it still uses a HEPA filter from 3M Korea. 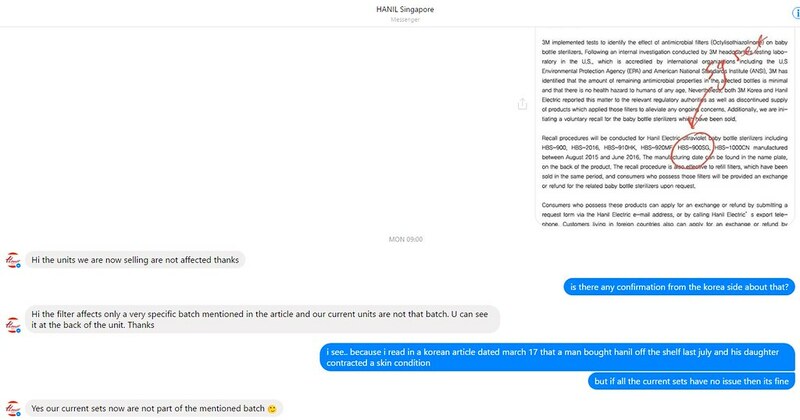 It really would have been better if a clarification like the above message was posted on Hanil’s (Korea/Singapore) social media platforms to reassure customers instead of deleting posts related to the issue. 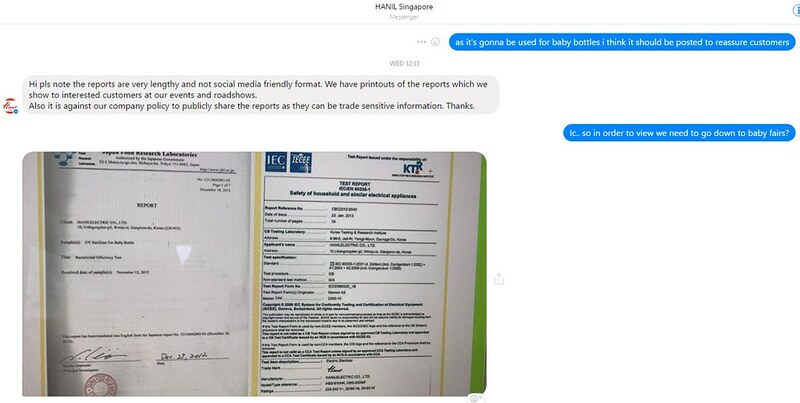 So the answer, according to Hanil Singapore, is yes, its sterilisers are safe to use as 3M Korea removed OIT from its filters. B) Haenim: Did Haenim use the same name as Haenim Toys in an attempt to mislead people into thinking they were the same company? What about ST Electronics Co. Ltd & ST Electronics? Haenim Toys is a Korean brand most popular for its plastic play yards. When Haenim Baby was introduced in Singapore, many people were confused between the two companies and alleged that Haenim Baby intentionally copied the name to confuse people who didn’t know any better. In Korean, Haenim Toys is written as ‘햇님토이’ and Haenim Baby is written as ‘해님베이비’. Both refer to the Sun. To English speakers who are not proficient in Korean, this may seem confusing as the English name is romanised the same way. From the company’s reply, the name was chosen as the UV rays resemble sun rays. I’ve also read comments about people getting confused between Haenim’s parent company, ST Electronics Co. Ltd and ST Electronics (ST Engineering). This seems to be limited to non-Korean speakers as searching “ST Electronics” in Naver displays Haenim’s website as the main result. After comparing all 4 brands, I’ve decided to stick with Haenim. Though it is the most expensive brand among the four on normal days, it is the only brand with a drastic price drop during baby fairs and pre-orders (as low as $299). 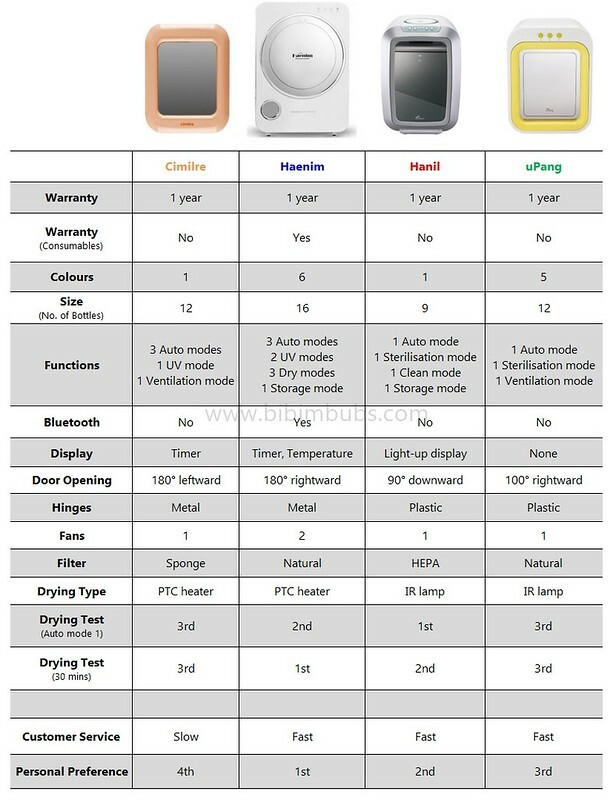 It also doesn’t make sense to rank it over Hanil with its storage mode, HEPA filter (OIT-free…?) and touch sensor buttons. uPang would have been ranked higher if it had a digital display and its door could be opened wider. Nevertheless, it is a no-frills, basic steriliser. I hope this in-depth review will help you in making your choice when purchasing a UV steriliser! Thanks for the really informative post! I’ll be heading to Korea for a work trip and planning to buy the Haenim sterilizer and Spectra breast pump in Korea for cost-saving. May I know where can I buy them? And will these products be covered under warranty in SG? Many thanks!! I got my BIL to hand-carry it back from Korea. If you intend to do that as well, I don’t think it’ll differ much from the baby fair pricing. There’s one this weekend! SG sets are covered by local warranty but not sets from other sources. Not fair to the local distributor to cover warranty from other sources as well hahaha. Steriliser = 240,000won ~ S$292 without warranty. Baby fair price is $329 with 2 free UV lamps and 1 year local warranty. 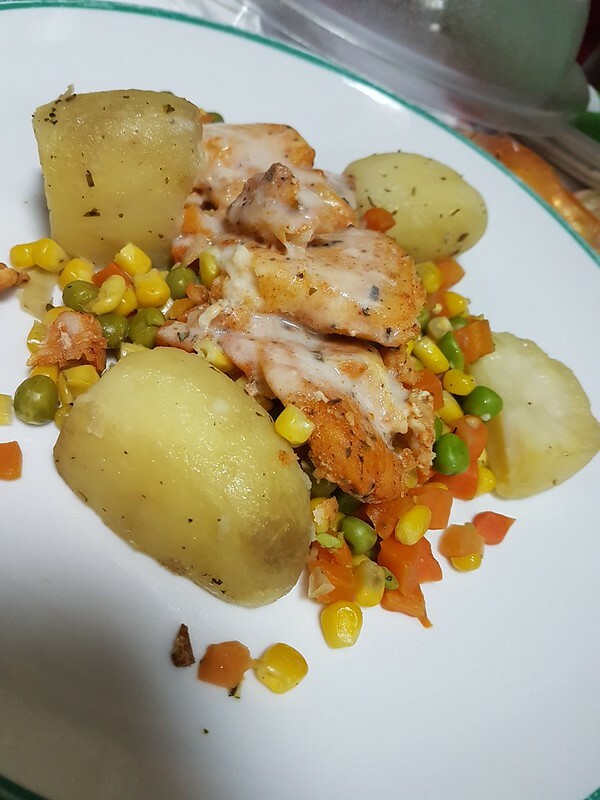 Hi, thanks for such an amazing post! So useful! I own an affected Hanil UV sterilizer, bought in Singapore. Could you please let me know how I can contact the company customer services as you did? The retailer I bought it from online has totally ignored my emails and I now live abroad. I couldn’t find the email/number of the official 3M/Hanil company in Singapore. Hi, I’m so sorry I only read your comment now. I’m more active on Facebook. From what I know, they will only replace the filter. I’m not sure if it’s worth it to chase them since you’ve already relocated. Perhaps you can try to get a new 3M filter? I messaged the retailer on Facebook..
Hi, are u able to add on review for cont haus uv sterilizer as well? It’s rather cheaper but not sure on its quality. Appreciate it!!! Sorry for the late reply. I only compared the 4 main brands… as for adding on new sterilisers, perhaps I’ll do an update when budget and time permits! What an awesome review! Thank you!!! Hi, did you notice a ozone smell using any of these machines? I just bought a uv sterilizer different brand and my baby bottles came out smelling like burned uv light. I’m scared to give my baby items with that smell. Hi! Which brand are u using? I’m using Haenim and have yet to notice weird smells. Hi! I have a Haenim as well, and was wondering if you know whether silicon items (eg Haakaa pump) and breast pumps cups can be put into the steriliser as well? I recall the promoter saying any material is ok except latex. But both Haakaa and Freemie said not to use uv steriliser. Thanks! Hi Cel! Sorry for the late reply. I’ve thrown Haakaa into the UV Steriliser many times. I think the yellowing occurs over time regardless of sterilising method? Any thoughts on the haenim vs the new upang plus?